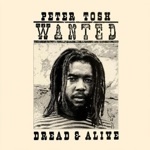 Peter Tosh’s 1981 release “Wanted Dread or Alive” is one of my all-time favorite albums. I find myself choosing this one more than any of the rest. Don’t get me wrong, Peter Tosh couldn’t make a bad song if he tried but there’s just something about this upbeat, drum and bass infused album I just can’t get enough of.